Nominations are currently closed. The next nomination period will begin this fall. Please check back then if you are interested in joining the alumni board! 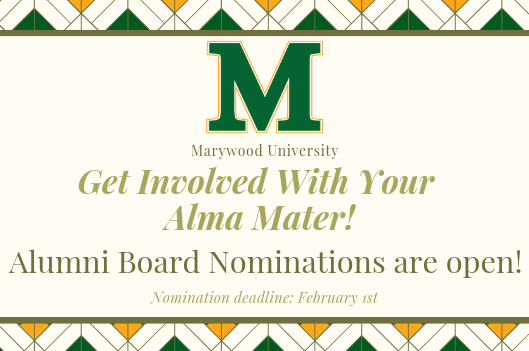 A member of the Alumni Board of Directors is appointed to hold the position based on demonstrated involvement, support, and commitment to Marywood University and the Alumni Association. In accepting this three year appointment, the member agrees to fulfill, to the best of their ability, the requirements and responsibilities associated with Board membership. Minimum of five Board meetings per year; minimum of one committee meeting per month/as scheduled (note: board meetings are typically held on Saturdays); and Alumni engagement events.